Sine Die is an urban mobility concept designed for the streets of the magnificent Paris, were people use to take a lot the undergrounds were they will cross millions of people during their lives but won't meet anybody for most of them. 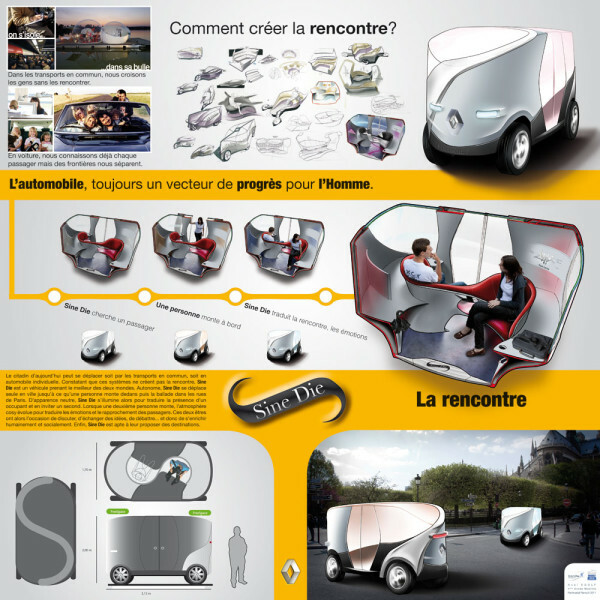 Fully automatized, this tiny vehicle is driving itself in the nice neighborhoods of the city. Empty, its lights are turned of. With a single person inside, it illuminates itself in bronze. Thus, you know you can call Sine Die and take a ride and then meet people. Cosy, the atmosphere has been thought to allow people to feel safe and conformable with unknown people. During the trip, Sine Die will take you randomly to the best places and so help you to discover one of the most beautiful cities of the world... and continue to discover your passenger.